Boston Access Advocates for the Deaf | Boston Access Advocates for the Deaf (BAAD) is an information-sharing and advocacy network consisting of Deaf, Hard of Hearing, and Hearing individuals with a vested interest in inter-modal communication. Meeting will include announcements, group activities and social chat. We will begin hosting a calendar and links to community resources. We will facilitate a poetry jam at BU after the general meeting. We will film the event and upload footage onto the web. We will begin relations with NYC ASL Slam. 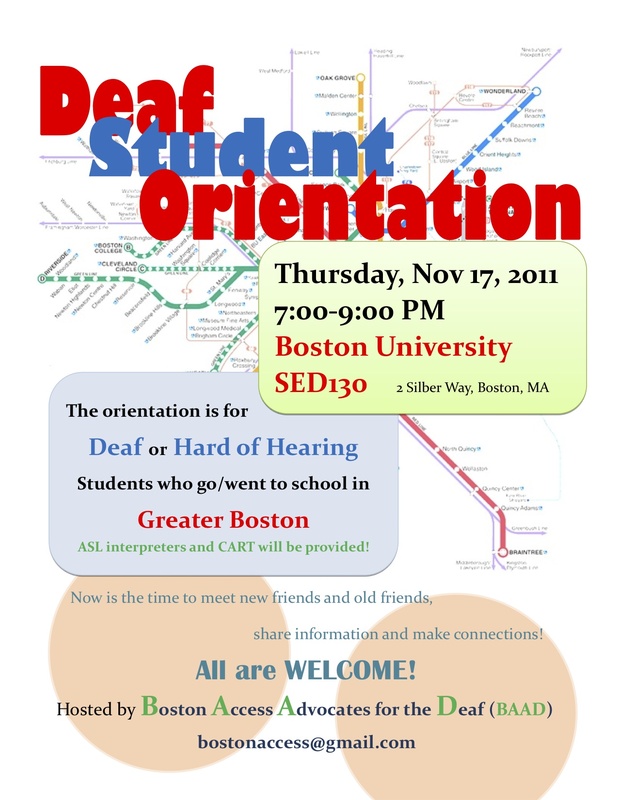 Thank you to all who came to the 3rd Annual Greater Boston Deaf Student Orientation at BU last Thursday! Students and alums representing BU, Northeastern, MIT, UMass Amherst, Simmons College, Suffolk University and Yale were in attendance. Presentations were given by representatives from Boston Access Advocates for the Deaf (BAAD – https://bostonaccess.wordpress.com/), Massachusetts State Association of the Deaf (MSAD – http://www.msad.org/), Massachusetts Commission for the Deaf and Hard of Hearing (MCDHH – http://www.mass.gov/eohhs/gov/departments/mcdhh/– updated website! ), and Deafblind Community Access Network (DBCAN – http://www.deafinconline.org/services/dbcan.html). Thanks to Casey Pancaro, Alan Gifford, Mikey Krajnak, and Elaine Ducharme for sharing more about their organizations and what they do. MSAD had their annual conference earlier in the month, Mikey gave a great overview of the services MCDHH provides, and Elaine shared the work DBCAN is doing to help consumers lead independent lives in part by training people to become SSPs.Lots of socializing was going on after the presentations ended, helped by the icebreaker in the beginning when current students and alums introduced themselves, their college(s) and programs of study. This wonderful event was hosted by Taichi Takeda and Lauren Parlapiano! 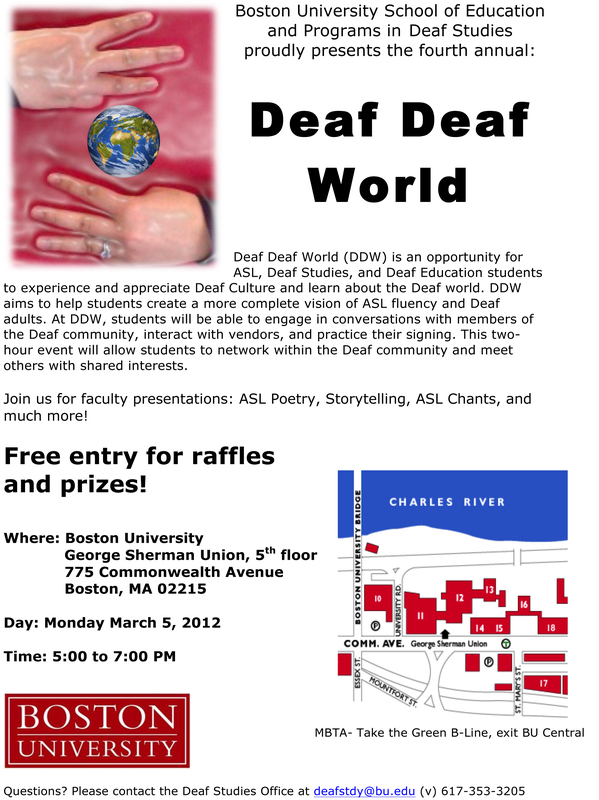 BU provided the space as well as ASL interpreters and CART. The annual HLAA Walk for Hearing in Boston will be held in Artisani Park on 10/16. Rob is now a board member at DEAF Inc.
Betsy is serving on the advisory committee for the MCDHH. Julia is working on BAAD Boston/NYC development for her Columbia dissertation. Casey will be moving to Japan in January for one year. Matt will be moving to Arizona for an indeterminate time. FALL ORIENTATION: The 3rd Annual greater Boston Deaf student orientation will be chaired by Taichi Takeda with the supervision of Julia and Nathan Fowler. WEB PRESENCE: Maintenance of the website, Twitter account and blog are a primary objective. All board members will be given access to the Twitter and blog. Julia and Matt will work on upgrading the website by uploading/organizing community links and network resources. Julia will sync all sites and accounts. SPRING YOUTH EVENTS: After two years of attempts, all board members agree that hosting a college panel at TLC is still worth pursuing. Rob will chair the event. Members agree that hosting a greater Boston youth field day during Deaf awareness week of 2012 is worth considering at a future date. CURRENT BOARD: Julia, Rob, Casey and Matt will stay on in their roles as internal director, finance manager, legal manager and media manager, respectively. Casey and Matt will serve remotely and Julia will commute. Betsy was nominated by Julia as the external director. This was seconded and voted on unanimously. 2011 MEETINGS: The executive board will meet again in early December. A general meeting will be announced at the Deaf student orientation and held between the orientation and December executive board meeting. NYC/BOSTON NETWORK: Julia will begin research on deaf community resources in NYC and organizing a network beginning with university students at Columbia and NYU. This process will be documented and shared at general and board meetings. Massachusetts Commission for the Blind, Boston Access Advocates for the Deaf, Northeastern University ASL Program, BATV Inc, Show of Hands Theatre Company (SOHTC) and UNO’s Pizzeria. The ASL Poetry Jam on April 24th was an inspiration and a success. CPM-TV producer Julia Silvestri kicked off the evening with an introduction of video clips highlighting the 2009 season of Eye to Eye (www.cpmtv.org). The audience was then engaged in a time warp through the work of Patti Wilson of the former Deaf Media Coalition. The featured DMC clip from the 1980’s included a panel introduced by Marie Philip and moderated by the deceased Larry Fleischer, the father of Deaf studies. The Philips’ family were warmly welcomed and shared insight into the life of Marie, a tireless advocate for ASL and the deaf community. Sue Philip was a key presenter who discussed the legacy of Marie and emphasized the importance of continuing on with her work. Patti Wilson from CT showed the spirit of Marie, captured in media designed to preserve and perpetuate ASL and Deaf culture. Dennis Cokely was superb in his narrative of Marie’s involvement in the intellectual properties of ASL. Patrick Costello lent us his humor, much to our delight, sharing memories of Marie Philip at work at The Learning Center in Framingham, MA and at Boston University. Together, they gave us a sentimental hint of what needs to change and what will remain the same. The poets for the evening expressed the art of ASL in its contemporary form. Ayisha Knight Shaw gave a heartfelt rendition of Phenomenal Woman by Maya Angelou in memory of Marie Philip and her phenomenal existence. Gratitude goes out to Tom Bourque for his beautiful poetry about nature that reflected the essence of Marie’s life and her ability to make a difference in every single person she met on Earth. Final thanks goes out to Elbert Joseph and his zany presence in moderating the evening’s program with grace and charm. While the annual ASL festival at Northeastern will not be held this year, CPM-TV and BAAD will continue the tradition of celebrating ASL and honoring past advocates by hosting an ASL Poetry Jam! In addition to featured artists, including Ayisha Knight and Tom Bourque, several presenters, including Dennis Cokely and Patrick Costello will share insight on the critical role of Marie J. Philip in the ASL movement. Along with poetry and presentations, Culture in Perpetual Motion Television (www.cpmtv.org) will showcase a film segment that relates to the multimedia potential of ASL in the future. BAAD will faciliate a potluck dinner featuring menu items from restauraunts around Boston. To participate in the potluck, email bostonaccess@gmail.com! Boston Access Advocates for the Deaf · Boston Access Advocates for the Deaf (BAAD) is an information-sharing and advocacy network consisting of Deaf, Hard of Hearing, and Hearing individuals with a vested interest in inter-modal communication.